The increasing emergence, re-emergence, and spread of deadly infectious diseases which pose health, economic, security and ethical challenges for states and people around the world, has given rise to an important global debate. The actual or potential burden of infectious diseases is sometimes so great that governments treat them as threats to national security. However, such treatment potentially increases the risk that emergency disease-control measures will be ineffective, counterproductive and/or unjust. 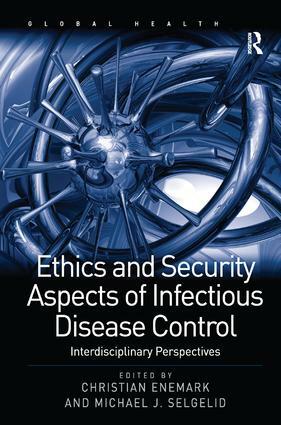 Research on ethical issues associated with infectious disease is a relatively new and rapidly growing area of academic inquiry, as is research on infectious diseases within the field of security studies. This volume incorporates ethical and security perspectives, thus furthering research in both fields. Its unique focus on the intersection of ethical and security dimensions will, furthermore, generate fresh insights on how governments should respond to infectious disease challenges. Readers should include professionals and scholars working in infectious disease, epidemiology, public health, health law, health economics, public policy, bioethics, medical humanities, health and human rights, social/political philosophy, security studies, and international politics. Michael J. Selgelid is Associate Professor and Director of the Centre for Human Bioethics, Monash University, Australia. Christian Enemark is Reader in Global Health and International Politics at Aberystwyth University, UK. The benefits of globalization are potentially enormous, as a result of the increased sharing of ideas, cultures, life-saving technologies and efficient production processes. Yet globalization is under trial, partly because these benefits are not yet reaching hundreds of millions of the world's poor and partly because globalization has introduced new kinds of international problems and conflicts. Turmoil in one part of the world now spreads rapidly to others, through terrorism, armed conflict, environmental degradation or disease. This timely series provides a robust and multi-disciplinary assessment of the asymmetrical nature of globalization. Books in the series encompass a variety of areas, including global health and the politics of governance, poverty and insecurity, gender and health and the implications of global pandemics.